This is one of those creatures that has been haunting my hard drive for a number of years, games and editions. It was the seeing them again in White Dwarf that made me dust them off and put on a fresh coat of paint for Monday. Rusalka is often used, and confused, for a lot of different water creatures. But the true Rusalka is a fearful undead creature. 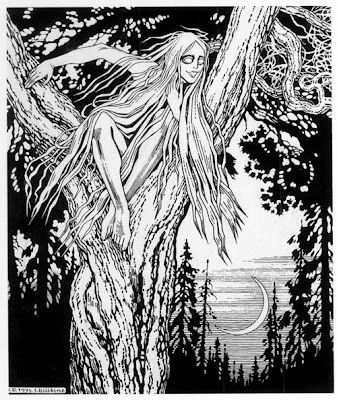 In all cases the Rusalka is the undead spirit of a young woman that had drown. The circumstances of her death vary; some say she drowned with out being baptized first, others again say she died while drowning her own children (which will sometime result in a Navky or Utburd). But most say the surest way to become a Rusalka is to be a witch. 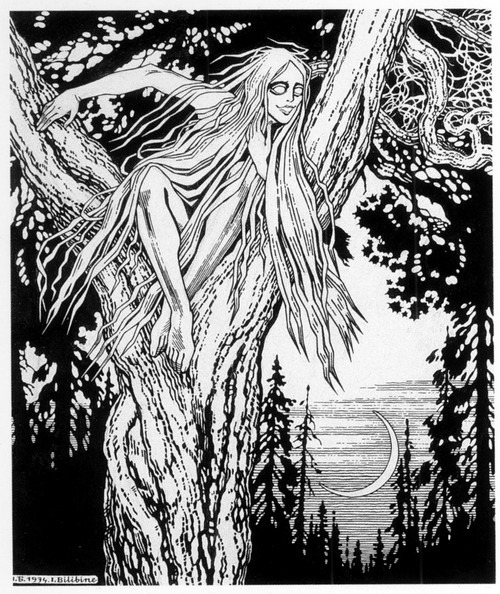 The Rusalka is most often found near the area where she died. Often hiding near a tree close to the water where she died. She can wander away during night, but she must return before sunrise or face complete destruction. She can move about during the day, but she can't attack. Also during the light of day she can be seen for what she is; an undead creature. They may become incorporeal at will, but are forced into it at sunrise. In anycase she can only be hit with weapons of +1 or better. The Rusalka will attempt to charm her victim into an embrace. She will then attempt lure the victim into her watery grave to drown them as they had been drowned. The victim she chooses is often tied to her reason for dying. If she comited suicide over love or was spurned by a lover she will go after victims that remind her of her former love. If she curse for drowning a child, then she preys on children or mothers with small children. Rusalkas that were drowned for witchcraft will seek out victims that remind her of her captors; men of religion, war or other magic-using characters. The Rusalka may be turned as a Wraith, but the only way to truly destroy one is to find her corpse and give it a proper funereal. A pyre is usually the preferred choice. The Rusalka has no need for treasure so she never keeps any. There will be treasure left over from her victims. Typically this will be a few gems, 2-20 (2d10) of 5 to 20 (1d4 x5) gp each. OGL Section 15 Rusalka Copyright 2012 Timothy S. Brannan. All text is Open under the terms of the OGL. Art is in the Public Domain. Links are not considered part of this entry and are not under the OGL. Watery undead didn't to up the creepiness factor for me for some reason. I'm more visual, I guess - the picture does it for me. I would run. Fast.